A3 Size 10.7 x 14 in. (272 x 356 mm) 11.7 x 16.5 in. (225 x 334 mm) 12 x 16 in. MEDIUM 15.5 x 20.4 in. (394 x 517 mm) 19 x 24 in. Maitreya, meaning the ‘Loving One’, is the bodhisattva who is destined to become the future Buddha of the next ‘auspicious era’ or bhadrakalpa. As a bodhisattva Maitreya presently abides in the celestial heaven or pure land of Tushita or Ganden (Tib. dGa’-ldan), meaning the ‘Joyous’, which is the heaven in which Shakyamuni Buddha resided prior to his descent to Earth. And just as Shakyamuni attained enlightenment under the bodhi tree, so Maitreya will attain enlightenment under his own specific tree, which is the nagakesara or ‘snake’s-hair’ champaka tree. A flowering branch of this champaka tree (Michelia champaka), with its fragrant white flowers, is Maitreya’s most characteristic attribute or emblem. 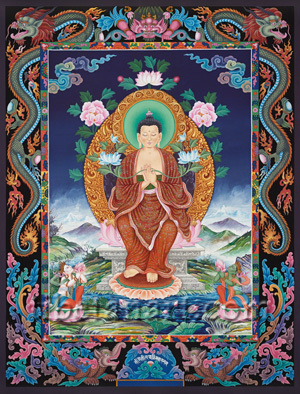 As the forthcoming Buddha of the next aeon, Maitreya is commonly represented seated upon a raised throne in Western fashion, with his legs and feet hanging down, and in this colourful composition he is shown seated in this posture. Maitreya is golden-yellow in complexion and is adorned with the thirty-two major marks and eighty minor signs of a fully enlightened Buddha. He sits serenely upon the seed-head of a pink lotus that rests upon an ornate silver throne, the steps of which are decorated with auspicious scrolls and lotus motifs, with a frieze of roundels that contain little images of swans, elephants and lions on its uppermost step. On the main façade of the throne are the symmetric images of a makara or ‘crocodile’ and a coiling dragon, with Maitreya’s bare feet resting upon the seed-head of a pink lotus-pedestal that arises above the lotus lake below. Maitreya has two compassionate bow-shaped eyes, long earlobes, and a small jewel-shaped golden urna between his eyebrows. The curls of his dark blue hair and head-protuberance (Skt. ushnisha) coil clockwise towards the right, with the small pink lotus at his crown supporting his characteristic emblem of a small white mahabodhi-stupa with a golden pinnacle. In Nepal it is believed that in the future Maitreya will transmit the teachings of Shakyamuni Buddha at Swayambhu Stupa in Kathmandu. Maitreya wears the three red robes of a Buddhist monk, with his lower robe (antaravasaka) decorated with floral motifs, his upper robe (sangati) decorated with dragons and clouds, and his dark inner garment (uttarasangha) secured around his chest with a belt. With his two hands held before his heart in the teaching or ‘wheel-turning’ dharmachakra-mudra he holds the stems of two blue utpala lotus flowers between each of his thumbs and forefingers. These two lotuses blossom at the level of his shoulders, with his right hand lotus bearing his golden emblem of an eight-spoke wheel or dharmachakra, and his left hand lotus bearing a golden water-flask or kundika. His dark blue inner aura is decorated with dragon motifs, and his golden outer aura and halo are embellished with beautiful scrolling golden motifs, with flowers and leaves appearing in the dark upper sky behind his aura. Kneeling upon moon discs and pink lotuses to the lower right and left of Maitreya are the goddesses White Tara and Green Tara, who each gaze upwards in adoration to Maitreya whilst offering lotus blossoms with their raised hands. Both Tara’s are similar in appearance, with divine silk garments, golden ornaments, flower garlands and five-jeweled crowns. White Saptalocana or ‘seven-eyed’ Tara has three eyes on her face and four eyes on her palms and soles, whereas Green Tara has only two eyes. The background landscape of this composition has colourful clouds in the upper sky, cloud-capped snow peaks on the distant horizon, with hills, trees, shrubs and rock formations appearing around the lotus-lake in the lower foreground. The narrow inner rectangular torana that frames the inner landscape is decorated with colourful sections of floral, geometric and flame designs that resemble brocade patterns. While the dark outer torana is decorated with the auspicious and mythical creatures of: the serpent-devouring face of Chepu or kirtimukha at the top centre; a pair of fierce jewel-grasping dragons that ascend upon each side; two makaras or ‘water-dragons’ in the bottom corners with long stylized and feather-like tails, and a white Ranjana inscription at the bottom centre that reads, Shri Maitreya Bodhisattvaya Nama.